"Pickett's Charge! 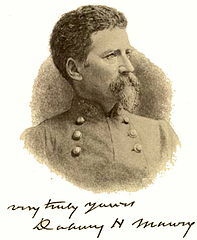 Battle of Gettysburg"
The Southern Historical Society is a public organization founded by Confederate Major General Dabney H. Maury in 1868-1869 and documented Southern military and civilian viewpoints from the American Civil War. These were compiled into the Southern Historical Society Papers, published in the late 19th Century, comprising 52 volumes of articles written by Southern soldiers, officers, politicians, and civilians. Longstreet's Grand Assault, more popularly known as Pickett's Charge, was an attack that still stirs emotions in many students and buffs. But although many volumes have been dedicated to this single assault, the history of the charge remains incomplete, with sources showing conflicting answers for elementary subjects such as the total number of men who actually participated and died in the charge, total number of cannons employed for each side, how long did the Confederate cannonade last, and to one of may favorite, where exactly was Gen. Pickett during the fight. From their entrenched positions, Federal soldiers decimated the charging Rebels, leaving the field littered with the fallen and several Southern divisions in tatters. Written by generals, officers, and enlisted men on both sides, these firsthand accounts offer an up-close look at Civil War combat and a panoramic view of the carnage of July 3, 1863.